This Krabi Beach guide comprises of several stunning sandy beaches tucked away to the east of Phuket in a cosy corner of the Andaman Sea. This particular area is beautifully complimented with some of Thailand's most awe-inspiring limestone karsts. These breathtaking rock formations rise quite dramatically from out of turquoise seas to become majestic backdrops adding a fascinating ambience to these beautiful beaches. Not only is this the perfect opportunity to relax whilst sunbathing and swimming, but for those of you who crave a more energetic beach activity, there are also numerous water sports to participate in. Those of you who are into more adventurous activities, then these beaches also offer some very interesting coves and caves for you to explore at your leisure. The caves found here are full of stalactites and stalagmites forged over thousands of years. Just be aware that some of the beaches are only accessible by boat which I'm sure will add even more fulfilment to these exciting excursions. The best time to be here is from late October through to April when swimming, kayaking and snorkelling are at its best. During the rainy season between May and mid-October, beach conditions can deteriorate somewhat. So much so, some of the restaurants and resorts close down altogether during this period. Railay Beach at Laem Phra Nang actually comprises of four beaches which are accessible by boat from Krabi Town and a few of the other surrounding beaches. Names of each of the individual beaches are Ao Phra Nang, Ao Ton Sai, East Railay, and West Railay. All are nestled between high limestone cliffs. These limestone formations will appeal to you, should you be a rock-climbing enthusiast. Given the type of topography in and around Krabi, there is a huge potential for this sport. There's also several special climbing routes marked out with a range of various difficulties. No worries as there is no shortage of climbing equipment, lessons and instructors who are on hand to help you in any way they can. While Rock Climbing has become a pretty popular sport here, for those of you who come here for relaxation, there's plenty of super soft white sandy beach to relax on. 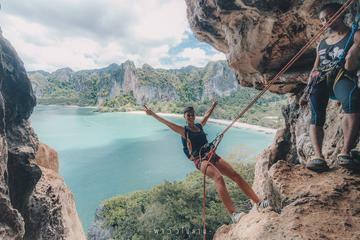 If you are the kind of guy who loves scaling walls and all, how would you like to scale the iconic limestone cliffs above Railay Beach on a full-day rock climbing tour in Krabi? This trip also includes caving, some light trekking and an abseil from the most beautiful viewpoint in Railay that towers 150-metres above the turquoise ocean. These trips run daily from 9:00 am to 5:00 pm. Also included is a free pick-up and drop off service from any hotel in Railay Beach, Krabi Town, Ao Nang, Ao Nammao, Nopparatthara or Klong Hang. Simply book your climbing adventure today and enter your hotel name at checkout. For more details about this trip, please view the link above. West Railay Beach is a Krabi Beach, sometimes known as Sunset Beach as well as sometimes being referred as the best beach in Thailand. Well, I will have to admit that it certainly does come close to perfect. Here you'll find crystal clear turquoise waters, a good stretch of an incredibly white silky soft sandy shore and a backdrop of some of the most impressive karst formations you could ever imagine. Just to round things off, there is also a good bit of welcome shade. This popular beach is lined with some mid-range resorts and a couple of restaurants with the only real downside being that the insistent drone of a gazillion six-stroke tractor engines all belting out monotonous tunes from their ever-present long-tail boats. Don't get me wrong, though, I love travelling with them. Somehow they sound a lot better when you are actually riding in one. These boats tend to start arriving around 8 am in the morning and continue non-stop until the sun goes down. If you feel you can put up with these tunes then there is no reason why you cannot have a great time here as the swimming is excellent albeit the shallow waters. East Railay Beach, on the other hand is probably the least attractive Krabi beach on the Laem Phra Nang headland and not suitable for swimming at all. In fact, there is no actual beach so much as the water line is covered with mangrove trees or what's left of them. Continual construction work seems to be the order of the day. This beach is only suitable for young people wanting cheap accommodation so personally, I would avoid this one as there's not much to see or do here at all. Ao Ton Sai Beach is not one of the best locations in Krabi as it is pretty much littered with rocks and can be quite murky at times during low tide making swimming virtually impossible. Although it is accessible by long-tail boat from Ao Nang beach at high tide with the trip lasting approximately fifteen minutes, it can also be reached from Krabi Town. It is, however, possible to reach during low tide periods if you are prepared to walk through the muddy shore to the beach over many rocks from West Railay. A word of warning, though, these oyster rocks as they are called, can be rather razor sharp at times. I would not attempt if you have sensitive feet like I have. The reality of this place are the settings of the many awe- inspiring orange and ochre striped karst formations which attract hordes of rock-climbing enthusiasts from around the world. Climbing is not the only activity in Ton Sai, as this Krabi beach is also an ideal location for plenty of party-loving backpackers who sometimes like to stay for weeks or months on end. One of the best activities is to hang around the many beach bars, getting stoned or pissed or both whilst occasionally flicking the wrist to throw a frisbee. After all, backpackers are also on vacation. Two of the most popular bars here are respectively called Chill Out and Stoners were posters plastered about show Bob Marley as a firm favourite. For those of you who have a little more energy, there are some dive schools if you feel up to it or perhaps even better, hire a kayak and try your hand at paddling to West Railay if you feel that you might make it. Kayaking through the caves is a must. Ao Phra Nang Beach or Phra Nang Cave Beach is a beautiful cove situated on the southwestern part of the Laem Phra Nang headland and only accessible by boat from Krabi Port. This beach is a lot more popular and busier than Railay West, especially during the high season from November through to April. Soft sand, clear shallow waters, a coral reef, rock pools and caves set against a backdrop of picturesque limestone cliffs definitely makes this a perfect beach getaway. And at low tide, you can simply walk along a sandbar to a tiny offshore island where you can do a spot of snorkelling. Check out the huge karst outcrop on the eastern edge of the bay. It uncovers the hollowed out entrance to Tham Phra Nang Nok (Princess Cave). Legend says that an ancient fertility goddess whom the locals believe still lives here controls the riches of the sea. The cave contains large phallic symbols and other strange offerings in the hope of increased potency and prosperity. The only accommodation that I know about on this beach is the Sheraton Rayavadeee Resort. This truly luxurious hideaway has the only direct access to the beach. Should you wish to spend a night or two or three, then this hotel will set the pace for a fabulous treat as it has all the right ingredients. Ao Nang Beach is a Krabi beach just west of Krabi Town and easily accessible by a road which runs right along the beachfront. Considering that Ao Nang is the tourist centre of Krabi due to its high concentration of restaurants, shops, hotels and resorts, the palm-lined stretch of the beach itself is pretty, albeit rather uninteresting only dominated by some large cliffs at its southern tip. Good for a bit of swimming or snorkelling, but that's about it. Ao Nang beach is mostly used as a jumping on and off point for day trips to the surrounding islands. Only after the sun goes down does the beachfront comes alive as people start returning from their island jaunts. Dining at the huge number of western restaurants, drinking and the occasional bit of shopping are the main attractions. Should you stroll through the numerous stalls you will come across a labyrinth of small bars where you will be greeted with warm smiles and cold beers. While the smiles are free, I am afraid you will have to pay for the beers. Hat Nopparat Thara Beach is a three kilometre Krabi beach that is reachable by road from Krabi Town. You will find plenty of natural shade from its many Casuarina trees, but unfortunately not much else. Development here is still in its infancy. Also, please don't expect to find any deck chairs or beach umbrellas on a beach that seems to be more popular with local Thai picnickers who prefer to just swim, eat and laze around in the sun. However, this Krabi beach is within easy walking distance from Ao Nang Beach and you could also take a walk to Koh Kao Pak Klong Island in the bay during low tide. Klong Muang Beach is a beautiful, secluded and quiet beach where you can leave the crowds behind and virtually have the whole beach all to yourself. This Krabi beach also caters mainly for guests at some of its exclusive luxury boutique hotels and resorts. Sheraton Beach Resort is one such luxurious accommodation on the beach that has the ideal setting for a perfect getaway.